Pharmacology is a difficult class in nursing school. Pharmacology is the study of how a drug works on the body, its side effects on the body, and the way the body uses the drug. Most nursing students find pharmacology a tough course because you are required to know the name, side effects, nursing interventions, and the way the body uses the drug in such a short amount of time. Normally, a student takes a pharmacology class in one semester and may be are given only 3 weeks to learn 5-10 chapters of material. So, it can be very overwhelming, especially if you don’t know how to properly study. Don’t forget to subscribe to my YouTube channel for more videos! Developing a study method to use! Students tend to get overwhelmed by all the material they are required to know for a pharmacology exam and feel defeated when trying to develop a study method. Trying to memorize every single drug name and its side effects! The best approach is to memorize the drug group by suffixes and pre-fixes or classification. This will be discussed in the study strategies below. Cramming! It is really hard to juggle other classes along with pharmacology. Some students make the mistake of not setting aside enough time to prepare for an exam. Learn drug pre-fixes & suffixes and classification of the generic drug name rather than trying to memorize individual drug names! Most drug classes work on the same system of the body and have the same side effects. These classes tend to have similar pre-fixes and suffixes. If you try to remember similar pre-fixes and suffixes rather than individual drug names, you will be able to study the material easier. Furthermore, it helps eliminate trying to learn individual side effects and their pharmacokinetic abilities. Example: A set of cardiac medications known as beta blocker have a similar suffixes known as olol. Here are three beta blocker: Metoprolol , Atenolol, Propranolol….note how the all end with olol. These drugs also have same side effects such as slow heart rate, cold hands, feet, tiredness etc. and work on the body systems the same. Another example can be applied to when you are studying antibiotics. Most antibiotics are broken down by classification such as macrolides. Macrolides include drugs ending is mycin such as Erythromycin, Azithromycin, Clarithromycin. These drugs are metabolized in the same areas as well and have similar side effects. I personally think creating the flash cards is the best method because you have to look-up the material and formulate what to write on the flash card which requires you to learn the material again. Then after creating the card it is a great idea you repeat them aloud. When you create flash cards, don’t make the mistake of creating them two days before the exam because this will not give you enough time to study them. It is best practice to create flash cards after each lecture class. This is because if you don’t re-read or review what you learned in class the same day your brain tends to forget 70 to 80% of what you heard in class and creating flash cards helps prevent this. In addition, every day when you have downtime, review the flash cards. As a side note, there is a free site call studystack.com where people have uploaded pharm flash cards for you to use and you can create your own. Create fun mnemonic or acronyms and illustrations! 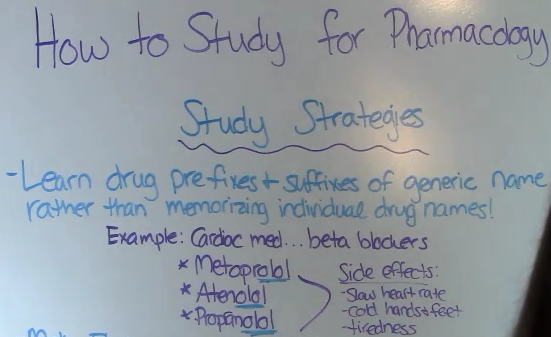 If you’re not good at this, there are so many free resources out there that have great mnemonics for pharmacology. I recommend using Pinterest or searching for it through Google. Teach others! You can do this with a classmate or to yourself. When you develop a teaching plan and teach others, it requires you learn the material and completely understand it on a critical-thinking level. Get a study guide! Nursing Pharmacology Made Incredibly Easy* is a great supplementary study guide that helps break down the pharmacology material. Also, many study guides have built in test questions and excellent mnemonic/illustrations to help your remember difficult material. Some professors will give out study guides a few days before the test to tell you want drug categories you will need to concentrate on. Don’t give up! If you have bombed your first exam don’t worry or give up. Learn from your mistakes and figure out what type of strategies I’ve covered will work for you. I suggest pick one or two of these strategies and make them your own. *RegisteredNurseRN.com is an Amazon.com affiliate and the items recommended by me in the post are based on my personal opinion as someone who has graduated from nursing school. Any purchase you make through Amazon.com by clicking the hyperlink, our website obtains a commission which helps fund our site.